A clear trend is that consumers are turning to non-surgical facial aesthetics treatments that help specially formulated products penetrate their skin for long-lasting, deeper results. We predict that medical facials such as HydraFacials or Guinot salon treatments will be big news in 2017. 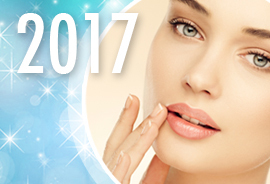 These treatments are the very essence of beauty and care – two buzzwords for facial aesthetics marketing in 2017 -, giving the relaxation and pampering of a facial with the underlying benefits of medically-proven skincare products. Medical facials are also popular because they can be tailored to the individual’s skincare needs, require no downtime and may be more affordable than many other treatments. The popularity of TV personalities such as Kim Kardashian and Kylie Jenner has done little to abate during 2016. Kylie Jenner’s lips, in particular, continue to attract a huge volume of Google searches with countless individuals wanting to emulate her fuller pout. According to Google Trends, Juvederm® and Juvederm® Volbella have both seen a spike in interest over the past three months, and lip enhancement looks set to remain a much-desired treatment for 2017. As with all facial aesthetics treatments, there’s a definite swing towards a desire for natural-looking outcomes. Over the past five years, interest in PRP Therapy – dubbed the ‘Vampire’ Facial – has been steadily growing with the some noticeable spikes, especially when Kim Kardashian was filmed having the treatment in 2013. We predict demand for PRP Therapy will continue to grow in 2017. It ticks the boxes for what patients are seeking right now – an anti-ageing treatment that has minimal side effects or downtime and uses the platelet rich plasma from the patient’s own blood rather than chemical or synthetic products. What do Madonna, Jennifer Anniston, Gwenyth Paltrow, Jennifer Lopez, Brad Pitt, Katie Perry, Justin Timberlake, Kate Moss and even Kate Middleton all have in common? According to the press, they’re all fans of oxygen-infused facials. The growing popularity of these treatments shows how celebrity opinion can influence trends, but also reflects the current desire for non-invasive facial aesthetics treatments that enhance our bodies’ natural processes. Oxygen-infused facials look set to be a ‘must-have’ anti-ageing treatment in 2017. ‘Fat freezing’, ‘cryolipolosis’ and ‘coolsculpting’ are all search terms that are rapidly trending upwards according to Google Trends. Again, the growing popularity of fat freezing treatments such as Coolsculpting is the promise of visible body sculpting results without the need for invasive fat removal surgery. People are keen to minimise the risks of aesthetic interventions and reduce the costs. Having looked at our predictions for the top five medical aesthetics treatment trends for 2017, we wanted to have a quick look at the mood across the industry and the marketing techniques we think will be big news over the next 12 months. As we mentioned above, the prevailing mood is around beauty and care, aesthetics and function. Consumers want to feel that they are in safe hands and are showing a strong preference towards non-invasive treatments that can give quicker, safer and more natural-looking results than surgical interventions. People want to come into a clinic and be pampered, receive a bespoke treatment that’s relevant to their skin, and leave looking fantastic. They want value for money, to know that as well as helping them to look good, a treatment or product is continuing to enhance their skin. It’s also worth pointing out that many marketers are calling the phase we’re moving into a period of ‘post-demographic marketing’. What they mean by this is that traditional demographic segments such as age, gender, location or income can no longer be used to define consumption patterns. For example, in 2015, six percent more men than women searched for ‘hair care’ and related terms. People are seeking to move away from set identities – they want to define themselves and are using beauty treatments, including facial aesthetics, to feel empowered and confident. You may want to visit your data and see if your treatments are attracting the type of patient you expect or whether you need to market to a different patient group altogether. What are your thoughts? Have you seen an upturn in enquiries for these treatments in your own clinic? If you need help with any aspect of your marketing in 2017, Cosmetic Digital is here for you – call us on 0115 9140 640 to start a conversation.